Video of a mold clearance test in Macomb County. The object of doing a mold remediation (clean up) is to get the spore count down to normal levels. Mold is a normal part of the natural environment and can be found just about everywhere. I am not in the business of trying to scare people into expensive mold testing. With that said...although this house had a mold remediation done by a licensed mold contractor, it failed the clearance test. As I MENTION in the video, I had concerns about his house passing the test just based on what I saw when I walked in. I saw moldy debris in the duct work and my equipment told me that the humidity levels inside the house were much higher than outside. When I received the test results back from the lab, my samples indicated elevated levels of molds in the house. By "elevated" I mean they were much higher inside the house than outside, and much higher than other buildings I have tested. It is not unusual to have a variety of molds show up in a sample as this one did and black mold was one of the molds detected. Quite frankly, this remediation company should have known better than to pay me to test a house that was obviously going to fail. I have a certificate that says I am qualified to do mold remediation but I have never actually done one for a customer. 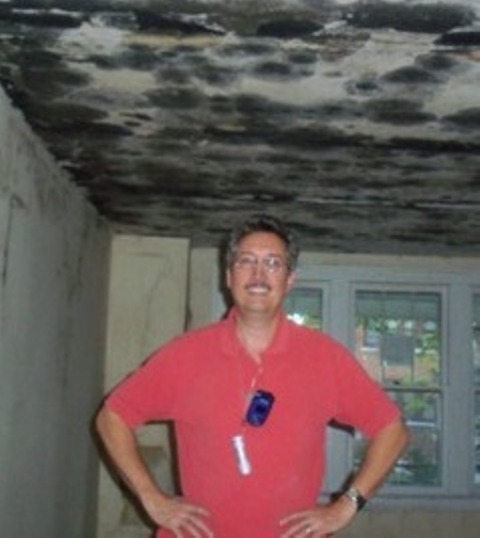 I have done some mold remediation on my own projects so my experience in doing actual clean-ups is limited. However, it is amazing how far a little common sense can take you. Just from being in the field, taking samples and documenting my observations and keeping and studing the data I collect, I had real concerns about this project the minute I walked in the door. I will post the data results to this project at a later date. I am professionally trained to test for dangerous mold. I have the equipment and training to test each level of your home. I test for airborne contaminants, mold on walls and HVAC systems. The samples I take from your home are analyzed at the laboratory by experienced microbiologists and environmental microscopists. Reasons to have your home tested: if you have small children, are pregnant, are elderly, have a weakened immune system or have allergies. There are many particles that can affect your health like pollen, mold spores, fungi, fibers and many aerosols. Having your home tested is the first step towards ridding your home of dangerous particles. I love being in the filed taking environmental samples and documenting the data. 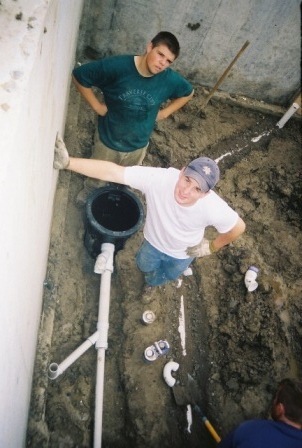 It beats the hell out of sitting in front of a computer in an office all day as I did at General Motors ...and getting dirty is just part of the job. The field work is interesting and educational because you are always running into different situations in buildings and using what you know to solve environmental mysteries for your customers. In the photo at left I am taking a sample of the air for mold in a hundred year old building in the Detroit area. Here in Michigan, ideally the mold spore count will be in the hundreds, not in the thousands. When you can see large amounts of mold on surfaces as seen in the photo, the mold spore count will generally be in the tens or hundreds of thousands. 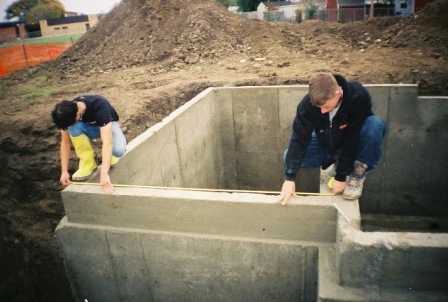 We also test buildings for radon gas. The Detroit area does have pockets of radon gas and radon is the number two cause of lung cancer in the United States. Under the right conditions, mold can grow on painted block. 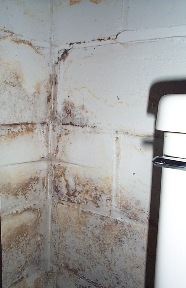 Mold is found both indoors and outdoors. 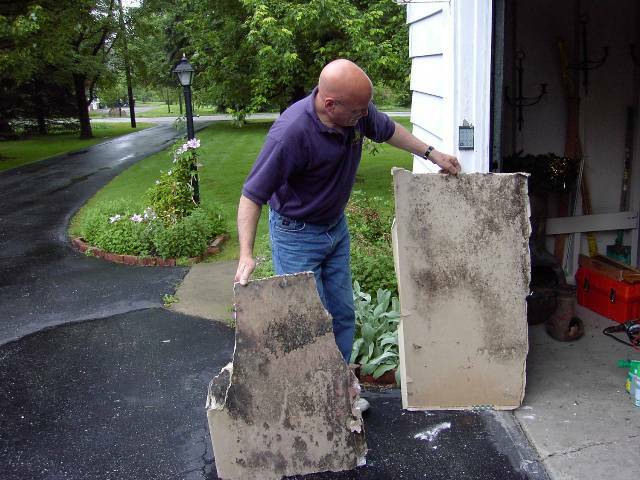 Mold can enter your home through open doorways, windows, vents, and heating and air conditioning systems. Mold in the air outside can also attach itself to clothing, shoes, bags, and pets and can be carried indoors. 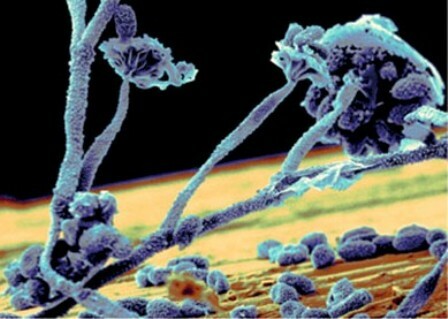 The Center for Disease Control (http://www.cdc.gov) has more information about mold and your family's health. *McGraw Hill Microbiology 9th Ed. In Michigan, where the humidity can be high, mold can easily grow on the BACK of drywall in total darkness and where you cannot see it. A sample of the air will detect mold where we cannot see it. Please read "Wood Truss Council of America's" facts regarding mold on wood structural building components.